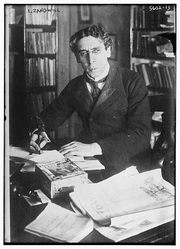 Israel Zangwill was a highly popular and influential author and a member of intellectual Jewish circles in London. He championed many social and political causes on behalf of the oppressed and minorities. He's best known for his satiric works and for his play The Melting Pot, which became a metaphor for the melding of many ethnic groups into a single nation. Israel Zangwill is currently considered a "single author." If one or more works are by a distinct, homonymous authors, go ahead and split the author. Israel Zangwill is composed of 10 names. You can examine and separate out names.